Wandering the waterfalls and striking scenic locations of southern coastal Iceland is fascinating enough as a tourist, but photographing another adventurous couple while they take in the majestic beauty of Seljalandsfoss was an experience we'll never forget. We met up with Alek and Thu, an Atlanta wedding photographer we know from WPPI, for some adventuring along the southern edge of Iceland's ring road, and despite overcast winter weather we had a breathtaking day. 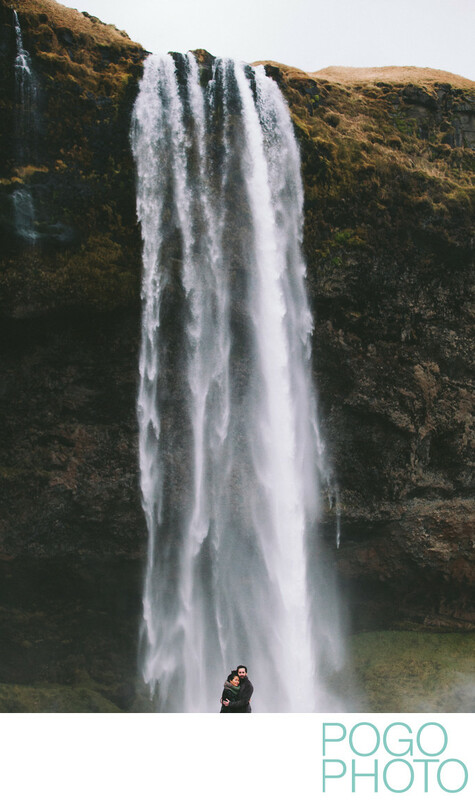 This waterfall in particular is a place we'll never forget, and highly encourage everyone to visit: Sejalandsfoss is just a stone's throw away from the main road, like many of the island's most famous tourist sites, and feels like stepping into another world. A muddy, worn path winds up and behind the falls, and the overhanging cliff feels like it's welcoming you into its embrace. The Icelandic way of quietly marking dangerous paths but not restricting people as they do in the United States is evident here: you could easily clamber up the side of the hill, but you'd better be prepared for a very steep climb if you do so. Likewise the small bridges and stairways over and around the water have railings, but nothing to prevent someone from leaning a bit too far and toppling in; bring your own common sense and you'll be just fine. 1/1250; f/2.8; ISO 1600; 70.0 mm.